"One word. Dialyseas. Auto water change/water purification all in one. A must-have on large tanks. Matter of fact, I won't do a big one without one." "Sounds like it's constantly wasting salted RO/DI water to use osmosis to distribute stuff across the membrane. Good stuff goes in when depleted if the new saltwater is at good levels and the bad products disperse evenly on both sides and half of them get washed away. Do you guys have 75 gpd of expensive salted RO/DI water to throw away? These guys must be out of their minds! Haha!" "The Dialyseas machines have been around for awhile, and could theoretically work, although I don't see how they are any better than water changes, which cost a lot less money." that... A hobbyist hopefully would never consider such a thing..."
What, exactly, is this device that arouses such passions? What does it claim to do? What does it actually do (for me)? How much does it cost to purchase? How much does it cost to operate? Why did I get it? I.1 What is the Dialyseas? 1) Water purification by removal of undesirable small-molecule contaminants (nitrates, phosphates, etc.). 2) Water change with a user-provided concentrated salt solution. 3) Water level and water salt content monitoring; adjusting both items upward to preset values as they are depleted by the dialysis process. Figure 1. My Dialyseas instrument and salt bucket. Note that this salt bucket is nearing the end of its useful life. The dialysis membrane is housed in the horizontal cylinder (red endcap on left) in the lower front center. 1) Does the Dialyseas actually purify the aquarium water? 2) Does the Dialyseas maintain the proper balance of water components in the aquarium water? Both of these questions will be resolved through experiment, as described in Section II. Figure 2. A schematic representation of the dialysis purification process. I.2 What Does the Dialyseas Claim to Do? The Seavisions website details Dialyseas' claimed benefits, which include reducing the concentrations of undesirable solutes (ammonium, phosphate, nitrate, etc.) to arbitrarily low levels, and maintaining high water quality almost completely automatically with little day-to-day input from the aquarist. Of course, the dialysis process doesn't discriminate between undesirable and desirable solutes (Ca2+, Mg2+, Na+, their anionic counterions, etc. ), hence the need to replenish these elements by (automated) salt addition. The issue of Ca2+ level maintenance is a complicated one, and data will be presented later that quantify the amounts of Ca2+ and Mg2+ removed during dialysis. This removal, balanced against the increase in calcium provided by different methods of Ca2+ supplementation, sets a practical limit on the amount of aquarium water that can be effectively dialyzed, which in turn sets an upper limit on the amount of purification that can be achieved via dialysis. In addition, success in maintaining water quality through a dialysis-based purification process is contingent upon indiscriminate transfer of water components across the dialysis membrane. If the opposite situation pertains, for example, then selective removal of some water components could lead to imbalances in the aquarium water's solute composition. If the added salt solution doesn't compensate for this imbalance, then the aquarium water's quality could degrade over time. Therefore, it is important to determine if differential solute removal and/or differential solute replenishment occurs during the Dialyseas' operation. The measured rate constants of ion transfer, as discussed above, will play an important role in the evaluation of the former issue, whereas assays of the concentrated salt solution's content over time will help address the latter point. These data are presented in Section II. I.3 What Does the Dialyseas Actually Do for Me? Monitors salinity via a standard conductivity probe. Monitors pH via a standard pH probe. Monitors ORP via a standard ORP probe. Adds concentrated salt solution to replenish salt removed by dialysis. This function is THE single critical feature that defines success or failure for the whole Dialyseas concept. Questions of salt quality, the feasibility (or not) of maintaining a reasonable salt composition in a "concentrated salt solution," and salt solution delivery mechanics all come into play when analyzing the Dialyseas' performance on this pivotal point, as discussed in detail below. I.4 How Much Does it Cost to Purchase? I paid $2990 in November of 2002 for the full-sized unit, version 6.59, including the pH and ORP electronics cards and shipping. That price included all components necessary for start-up. I.5 How Much Does it Cost to Operate? Three "consumables" must be replaced periodically: salt, membranes and probes. One salt bucket (~ 50 lbs of solid salt) lasts me about four months and costs about $55. The current price of Seavisions salt is $40 for 43.5 lbs (claimed to make 150 gallons of saltwater). Seavisions suggests that the probes should be replaced yearly, which costs: pH ($130), ORP ($130), conductivity ($108). I suspect, though, that any probe with equivalent connectors can be substituted. However, by using calibration solutions to first set and then test the pH and conductivity probes' accuracy, my experience is that the Dialyseas versions of these probes have greater accuracy than either of the cheaper Neptune system equivalents offered for the Aquacontroller system, or than a Pinpoint salinity monitor's salinity probe. I therefore now use Dialyseas probes on my Aquacontroller. I have replaced the pH probe at the one-year mark, but I have not yet replaced the ORP probe (and I don't plan to), and I have run through three salinity probes during the first 18 months of use (more on this topic later-some operator error, some probe malfunction). Seavisions further recommends that the membranes should be changed yearly or sooner depending upon use, but the criteria for judging if a given membrane is spent, the dialysis membrane excepted, are not clear to me. The manual does provide a measurable criterion for judging when the dialysis membrane should be replaced. It costs about $230 to replace all seven membranes. So, following Seavisions' recommended maintenance schedule would cost about $763/yr. Of course, most of these items (RO/DI membranes, replacement probes and salt) would have to be purchased for routine aquarium maintenance whether a Dialyseas unit were used or not. I.6 Why Did I Get It? (1) Tank size: No longer than 6'. I have an Oceanic 175-gallon bowfront (6' x 2' x 18-25"). (2)Eliminate water leakage if a catastrophic failure occurs. I worked with the building's architects to design a tank corral, which holds the tank/stand and the tank's maintenance equipment in an adjacent closet. This tank corral is lined with epoxy paint, has a floor drain, and can hold ~ 60 gallons of standing water (system volume = 167 ± 9 gallons-more on how this number was calculated in Section II.5). (3) Eliminate noise and humidity output into the office environment. With the architects, I designed a remote ceiling fan-based ventilation system that satisfied these requirements. (4) No manipulations of large quantities of water outside of the tank area; i.e., no garbage can-based large volume water changes. It is criterion #4 that led me to explore alternative water change systems that did not involve the movement of large volumes of water. After evaluating a few alternatives, it appeared that only the Dialyseas system could satisfy this strict prohibition on water manipulation. So, I convinced myself that no Dialyseas = no tank. From that perspective, the investment in this technology seemed warranted. This section contains an account of my experiences with the Dialyseas system. I had no help with setting up or operating the Dialyseas except for the instruction manual (more on this document later), so in the early stages of use my efforts could be characterized as proceeding in "fits and starts" via a lot of trial-and-error. As you will see, I made several rookie mistakes that led to self-inflicted problems, and along the way I identified several nuances in the Dialyseas' operation that made its use easier. It is my hope that anyone contemplating the use of the Dialyseas can learn from these episodes and have a smoother go of it. I should probably add parenthetically that my initiation of the Dialyseas experiment coincided with the beginning of my avocation as a marine hobbyist. I suspect that an experienced aquarist with a mature tank might have had a more intuitive feel for the set-up and operation of the Dialyseas. For me, however, the Dialyseas was the first piece of aquarium equipment, not the last, that occupied my attention. In addition, this section contains descriptions of the outcome of several experiments that test specific features of the Dialyseas system. The comments offered below pertain only to the manual supplied with my Dialyseas in late 2002. It is possible that these comments do not apply to more current versions of this document. First, some background to put my comments into context: I have spent over 25 years working with scientific instrumentation whose complexity equals or exceeds that of the Dialyseas'. These pieces of equipment all come with manuals of some sort, so I have experience with innumerable instructional documents similar to the Dialyseas manual. It is this reference point that serves as the backdrop for my comments. It is difficult for me to conclude that the manual is a strength of the whole Dialyseas package. It has a host of errors, both large and small. For aficionados of close adherence to the accepted rules of grammar and spelling, the manual is disappointing. Typos, grammatical blunders and spelling errors abound. For example, over 35 errors in grammar and/or spelling can be identified within the 7-page Introductory Material section. These problems in no way compromise the manual's content; they are simply distracting to those who prefer precise communication. On a more fundamental level, the manual suffers from several organizational errors that complicate information retrieval. It has the look and feel of a document that has been cut-and-pasted together, and then patched repeatedly. Several sections refer to capabilities or features of the Dialyseas system that no longer are present or germane to the model shipped. Explanations are long-winded and redundant in a few instances, whereas other critical discussions are either omitted entirely or are left to the reader's imagination. For example, the manual describes the operation of a salt mixer and salt solution return line that do not exist in the current version of the Dialyseas. In addition, the manual describes the set-up of a float switch that is not supplied with this version of the instrument. It turns out that these features/functions were contained in earlier versions, and information about the updated procedures that was relevant to the Dialyseas actually shipped to me was forthcoming from Seavisions only after I inquired directly. One final note: after pointing out in an e-mail that the conductivity calibration solutions the manual described were not, in fact, supplied, I was instructed to calibrate the conductivity probe using tank water and a conductivity-to-specific gravity (SG) conversion chart supplied by Seavisions. In short, the manual detracts from the whole Dialyseas experience, rather than enhancing it. Seavisions could do themselves and their customers a big favor, in my opinion, by thoroughly rewriting the manual from the bottom up to produce a cohesive and coherent document that enhances the user's (especially the first-time user's) experience. Equipment setup went relatively smoothly and was marred by only two minor complications. One of the internal tube/connector junctions leaked, setting off the leak detector. A call to Seavisions provided information on how to troubleshoot this problem, and the solution turned out to be no more complicated than replacing the connector with a new one supplied by Seavisions. It is interesting to note, however, that the leak detector system is not described in any detail in the manual, so in this case additional information from Seavisions was necessary. It turns out that two screws whose heads sit above the unit's floor, but under the two pump housings, constitute the leak detector. Any water that touches them activates the detector signal, and these screw heads must be thoroughly dried (not an easy task in their location) to rescue the Dialyseas from leak-induced alarm mode. A second setup problem involved a lack of congruence between (a) the manual's instructions on how to hook up the salt bucket, and (b) the actual components supplied. This issue was addressed satisfactorily through an e-mail exchange, but it is another problem that easily could have been avoided by updating the manual. I have equipped and then stocked my tank largely through mail order suppliers, and during this process I have had the pleasure of working with a host of exceptional vendors whose attention to customer service could serve as a model for successful e-tailing: Serdar from Phishy Business, Ming and Joleen from Atlantis Aquarium, Brent from Barr Aquatic, Andy from My Reef Creations, Frank from Reef Concepts, Ed at SeaSwirl, and so on. If you, too, are used to this level of customer service, then you, too, may conclude that Gerry Calabrese at Seavisions almost, but not quite, makes this list. Getting timely and helpful responses from him was a hit-or-miss proposition. Unfortunately he has, on some occasions, sent me excerpted manual sections that are not even remotely relevant to the issues raised. On the other hand, when I have connected with him on the phone, he has provided helpful suggestions and reasoned responses. In his defense, he appears to be virtually a one-man operation, and he seems to be away from the office frequently on installation jobs. Perhaps he is just stretched too thin. It is relevant to note that my need for manufacturer input faded quickly after a few setup concerns (see above), and this observation might be used to argue for the Dialyseas system's general robustness. The conductivity probe plays a crucial role in the Dialyseas' successful operation, as any malfunction or inaccuracy in the probe can lead to inappropriate salt levels in the aquarium. Initially, I installed this probe in the tank, not in the sump. I had no organisms in the tank at this point, so I did not anticipate the problems that biofouling would cause (see below). The first probe I used, supplied with the Dialyseas, was calibrated with an independently purchased 53 mS/cm conductivity solution rather than the refractometer-measured tank water as suggested by Seavisions (see II.1 Manual discussion). I was quite surprised to see that the same conductivity readings resulted from measurements taken with my tank water, the 53 mS/cm calibration solution, and a second 51 mS/cm calibration solution. (Note: A temperature corrected refractometer was used to verify the salinity of all solutions examined.) That is, this probe did not discriminate between three different salt-content solutions. Something was clearly wrong. Inquiries to Seavisions just generated a cut-and-paste e-mail response instructing me to use refractometer-measured tank water to calibrate the probe. When I insisted that a correctly functioning probe would not display the same reading for three different salt-content solutions, Gerry seemed confused and said that nobody else had done this experiment or pointed this information out to him previously. I lobbied for a replacement probe, and while he was thinking about this request, I accidentally dropped the probe into the tank-rookie error! This full immersion, even though it lasted only a few seconds, was enough to short out the probe. The end result-Gerry was happy to send me a second probe, but at my expense! The second probe was again placed in the tank and not the sump. This probe did respond correctly to solutions of different salt content, so finally I was in business. Over the course of two months, as live rock was introduced and algae started to bloom, I noticed significant probe drift. Its conductivity values would change by as much as 2 mS/cm over the course of a day, with no change in the tank's real conductivity as ascertained by refractometer measurement. This drift activated the Dialyseas as expected, and it began adding salt solution to compensate. The salinity therefore began fluctuating unacceptably. It was at this point when I realized that the probe's surface was being coated with algae. I cleaned it with mild soap and then mild acid per the instructions, and recalibrated it. The problem disappeared in the short term, but then reappeared quickly. I cleaned it again, this time with 1 M HCl, and that destroyed the probe. Again, a rookie mistake that an experienced aquarist probably would have avoided. So when my third probe arrived, I placed it in the (dark) sump, where it has remained for the past ten months. There is no evidence of algae growth on the probe, but I once had a tiny snail fasten itself to the probe's surface, causing spurious readings. I have recalibrated the probe at four months and then seven months of operation, and nothing at this point suggests that the conductivity fluctuation problems will arise again. (Seavisions recommends calibration every three months.) The probe functions satisfactorily. I wish that the manual would have discussed probe placement, but I think that an experienced aquarist would have anticipated this problem. II.5 How Much Tank Water Should I Dialyze? In principle, the more aquarium water that is dialyzed, the more undesirable contaminants that are removed. Of course, as discussed above, more dialysis leads to removal of more desirable solutes as well. What is the trade-off between the removal of undesirable and desirable water components? Some data follow, but first a digression in Experiment 1 about making analytical measurements. The use of any analytical procedure should be accompanied by some control experiments that determine the measurement's precision (= reproducibility) and accuracy (= finding the true value). In general, these types of data are available in the literature, but each aquarist would benefit from running these controls in order to compensate for variations in technique of syringe use, determination of a titration's endpoint, etc. Precision was tested by taking three independent measurements of tank water calcium and tank water alkalinity: [Ca2+] = 395, 390, 405 ppm; Average = 397 ± 8 (2%) ppm. [alk] = 4.05, 3.94, 4.00 meq/L; Average = 4.00 ± 0.06 (2%) meq/L. The observation that the measurements were within a 2% range lends support to the conclusion that my technique is satisfactory. Measurement accuracy was tested by preparing two stock solutions with known ion concentrations. Solution 1: 148 mg of CaCl22H2O in 107.21 gm of H2O = 372 ppm Ca2+. Solution 2: 149 mg of MgSO4 in 23.13 gm of Solution 1 = 370 ppm Ca2+, 1292 ppm Mg2+. Measurement of calcium levels in Solution 1 via the Salifert test kit: 360, 360, 375 ppm = 365 ± 8 ppm. These measurements are within experimental error of the true value. Measurement of calcium and magnesium levels in Solution 2 via Salifert test kits: [Ca2+] = 365, 360, 375 ppm = 376 ± 8 ppm. [Mg2+] = 1290, 1290, 1245 ppm = 1275 ± 26 ppm. Again, the measurements were within experimental error of the true values in each case. These data show that the Salifert kits and my technique can be relied upon to deliver meaningful numbers, at least within a range near these typical aquarium water values. The Solution 2 results indicate that there was no interference between the dicationic ions. Experiment 2: How much calcium and magnesium does the Dialyseas remove at a setting of 2 gpd? Thus, dialyzing 2 gpd (~ 36% of the water's volume/month) places tremendous pressure on the calcium and magnesium input methods to keep up with the loss. When I calculated these values, I immediately lowered the dialysis rate to 1 gpd (18% of water volume/month). The accurate calculation of these "% of water volume" values requires an accurate knowledge of the system's water volume. A simple and reasonably precise method (whose accuracy cannot be tested because there is no convenient independent method for measuring water volume) is based on the following premise: If the aquarium's water has a known concentration of a measurable solute, and a known quantity of that solute is added, then a second measurement of the solute's concentration will allow computation of the water volume. Of course, this calculation's accuracy can be no better than that of the solute concentration measurements, and through error propagation is about 5%. Experiment 3: What is the aquarium system's water volume? Water volume (in gallons) = 69.5(gm of CaCl22H2O added)/ (change in calcium concentration)*. Table 1: Data for calculation of total system water volume. The average tank water volume over these seven independent trials is 167 ± 9 gallons. Given the fluctuations in the sump's water level as a consequence of evaporation, water removal via dialysis and the top-off system's inherent hysteresis, these values seem remarkably consistent. The above discussion illustrates how the dialysis process depletes the aquarium water's calcium. Of course, biomineralization and abiotic precipitation of CaCO3 also remove calcium from the water as well. It is not possible to estimate the quantities of calcium lost via these calcium removal mechanisms. On the other hand, compensating for the removal of calcium through any pathway are the added Dialyseas concentrated salt solution and two calcium input devices, a calcium reactor and a Nilsen reactor. II.6 How Effective is the Dialysis Process in Removing Impurities and in Maintaining the Appropriate Ionic Composition of the Aquarium Water? Dialysis-based aquarium water purification is one of the three basic functions of the Dialyseas, and an independent experimental check of this capability seemed warranted. In addition, the companion question of differential removal of desirable water components was addressed also. I measured calcium, magnesium, alkalinity and nitrate by using Salifert test kits, phosphate by a Hach test kit, salinity by a refractometer, chloride and sulfate by Hanna test kits, and sodium ion content by an ion-selective electrode. The Salifert nitrate kit has low resolution compared to the other ions, and so large (50%) error bars are arbitrarily assumed in the measurements. The sodium selective electrode (Oakton) was calibrated with standard sodium ion solutions and used as described in the instructions. Chloride and sulfate concentrations are not commonly measured by aquarists, and anyone wishing to do so might benefit from independently testing the accuracy of the Hanna kits. My lack of familiarity with these kits prompted me to perform these tests with a series of standard sodium chloride and sodium sulfate solutions, and I found that the measured values ran consistently high for both ions by about 20%. Therefore, the chloride and sulfate concentrations discussed below were derived from a calibration curve that spanned the entire dynamic range of the experimental values, constructed from these standard solutions. The chloride test kit actually measures all halide ions present (i.e., chloride, iodide, bromide and fluoride), but the small amounts of the latter elements (at least in seawater) will not perturb the test results much. As indicated in Section I.1, a first-order kinetic model was used to calculate rate constants for ion transfer. This model has the following mathematical form: [X]/[X0] = e-kt, where [X] is the concentration of component X at time t, [X0] is the initial starting concentration of X prior to dialysis, and k is the rate constant for transferring the particular component X from the aquarium water to the waste stream. It is important to note that the experiment described below does not employ the Dialyseas instrument in its normal, or recommended, operational mode. Normally, the Dialyseas only runs for a short duration, once every 30 minutes. For example, at my preferred setting of 1 gpd, the Dialyseas actually dialyses the aquarium water for only 20 seconds every half-hour. The experiment described below utilized 2.0 hours of continuous dialysis, which is equivalent to about 9.7 months of Dialyseas-based tank purification at the 1 gpd dialysis setting. This time frame corresponds to a turnover of approximately 1.8 tank water volumes. No water component replenishment by salt solution addition was performed during the experiment, and so the solute concentration changes in the aquarium water reflect only the removal of components by the dialysis process itself. The rate of wastewater flow is such that the dialysis chamber waste stream compartment volume is exchanged approximately 1.3 times/min. The calculated ion transfer rate constants via the first-order kinetic model are all on the order of 10-3/min (see below), and so the assumptions underlying the use of the first-order kinetic model appear to be valid (i.e., solute removal rate >> solute transfer rate). In addition, the concentration of ions in the waste stream was fairly constant, an observation that further supports the use of the steady-state (and then the first-order) kinetic model (see below). For example, the terminal (2 hour) ion concentration values were no more than 20% decreased from the initial 15-minute values. Experiment 5: Monitoring the dialysis process. A miniature "aquarium" was set up in a sealable 5-gallon bucket. This reservoir was charged with 16.0 L of distilled water, 649.4 gm of Dialyseas dry salt mix, 115 mg of NaH2PO4•H2O and 276 mg of KNO3, mixed thoroughly, tightly covered, and allowed to sit for 24 hours prior to starting the experiment. 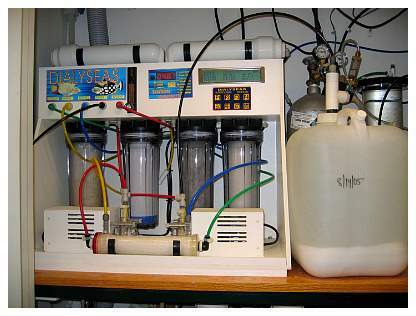 The Dialyseas uses a Baxter PSN120 dialysis membrane, which consists of benzylated cellulose hollow fibers. In the context of other available dialysis membranes, this particular choice could be characterized as relatively non-polar and uncharged (neutral). The Dialyseas influent line was placed in this reservoir, and the dialysis process was started. Approximately 500 mL of dialysate (see Figure 2) was collected to purge the fluid transit lines, and this sample was discarded. The dialysate effluent line was then placed in the reservoir, and the dialysis process was run continuously. At 15-minute intervals, the dialysis was stopped by turning off all water flow. The reservoir was sealed and thoroughly agitated to ensure that adequate mixing occurred between the existing water and the newly added dialysate, and then a 20 mL sample was removed. In addition, just before stopping the dialysis process, a 20 mL sample of the waste stream was collected. This protocol was repeated every 15 minutes for two hours. The 16 samples so collected were assayed for the indicated components, and these values, presented as a fraction of initial concentration, are shown in Figures 3 and 4 (below). In addition, derived quantities, like component ratios vs. time, transfer rate constants k, and half-lives t½ (half-life of X = the amount of time it takes to remove half of the X present) are given in Figures 5 and Table 2. The initial values of all of the measured parameters are: salinity = 35 ppt, [Ca2+] = 365 ppm, [Mg2+] = 1290 ppm, [Na+] = 11443 ppm, [phosphate] = 6.8 ppm, [NO3-] = 5 ppm, [alk] = 3.95 meq/L, [Cl-] = 20136 ppm, [SO42-] =3166 ppm. The initial pH was 8.06, and the terminal pH was 8.27. Over the course of the two hour dialysis run, samples taken at the eight different waste stream time points exhibited the following average values: salinity 5 ± 1 ppt; calcium 56 ± 7 ppm; magnesium 91 ± 10 ppm; alkalinity 0.7 ± 0.1 meq/L; phosphate 0.6 ± 0.2 ppm; nitrate 0.2 ± 0.07 ppm; chloride 3542 ± 308; sulfate 591 ± 160. The pH of the waste stream varied between 7.86 (30 min) and 8.21 (105 min). Figures 3 (top left), 4 (top right), 5 (bottom left) and Table 2. Test of the dialysis water purification process. 1) The Dialyseas' dialysis-based aquarium water purification system is an effective method to lower the concentrations of the undesired contaminants phosphate and nitrate. Although other ionic contaminants were not tested (i.e., nitrite, ammonium), there is no reason to suspect that these species would not be removed as well. The rate of nitrate removal appears to be measurably faster than phosphate, but the imprecision associated with the Salifert nitrate test kit's endpoint determination makes that conclusion a little suspect. 2) The Dialyseas' dialysis-based aquarium water purification system does not differentiate between, or differentially remove, any of the desirable cations Ca2+, Mg2+, or Na+. The data for the anions HCO3-/CO32-, SO42-, HxPO4(3-x)-, NO3-, and Cl- are not as clear-cut. If the Salifert test kit results for nitrate are to be taken at face value, then the Dialyseas does preferentially remove this anion. In addition, there appears to be a much smaller, but real, preference for sulfate and phosphate removal over Cl- and HCO3-/CO32-. However, these differences appear to be marginal enough so that they do not significantly affect the ion ratios (Figure 5) within the remaining test water. Even the ion ratio with the most conspicuous shift, [Cl-]/[SO42-], only changes by approximately 10% over the equivalent of 9.7 months of dialysis. In fact, this shift is towards the natural [Cl-]/[SO42-] ratio found in seawater! By this analysis, there is no reason to suspect that this dialysis-based purification will lead to significant or long-term ion imbalances among the aquarium water's desirable components. The salt solution's delivery function is the source of the greatest frustration that I have experienced using the Dialyseas. The salt solution's delivery mechanics are as follows: the user calibrates the conductivity probe using reference standards or tank water whose conductivity is known through an independent measurement. Then the user enters a conductivity set-point that corresponds to the desired conductivity. The conductivity of natural seawater (= 35 ppt salt content), for example, is 53.1 mS/cm at 77°F. So in the ideal situation, the conductivity meter can be calibrated to this value, but any arbitrary setting will do, as long as that setting matches the tank's desired salt content. This calibration is straightforward and doesn't present any problems. Next the user sets both high-conductivity and low-conductivity limits, and if these values are exceeded for any reason, the Dialyseas goes into "alarm" mode and ceases to function. The user must intervene in this circumstance and manually correct the salt content of the tank's water (dilution or salt addition, per the direction of error). If the conductivity is below the set-point but still above the low-conductivity limit, the Dialyseas will pump concentrated salt solution into the aquarium's water until the conductivity reaches the set-point. If the tank water's conductivity exceeds the set-point but is lower than the high conductivity limit, the Dialyseas does not add RO/DI water to dilute the salt. The addition of RO/DI water is controlled only by the sump's water level; otherwise, the sump could flood. Although disbursing a concentrated salt solution via the peristaltic pump system has the potential to clog the transit lines, I have never experienced this problem. The Dialyseas has performed these functions daily for over 18 months of continuous use without fail. The one frustrating flaw in my system, however, is the following: each time I have installed a new salt bucket, the aquarium water's salt content has exceeded the acceptable limit for a short period of time. This increase appears to occur at the 2 - 3 week mark after attaching the new salt bucket to the system (bucket 1: 3.5 weeks, bucket 2: 2 weeks, bucket 3: 2 weeks, bucket 4: 2 weeks, bucket 5: 3 weeks, bucket 6: 3.5 weeks, bucket 7: 10 weeks), and in each instance is characterized by an increase in the tank water's salt content from 35-36 ppt to 39-41 ppt over the course of a day (or less). With the exception of the outlying 7th bucket, these salt concentration increases appear to correlate with the increase in salt concentration of the salt bucket's supernatant indicated in Figures 6 and 7 (see Section II.8 below). They greatly exceeded the high-conductivity limits that I set, so the Dialyseas went into alarm mode in each instance. I have not yet been able to observe the Dialyseas during one of these over-salting episodes, so I do not know why it continues to add concentrated salt solution after the high-conductivity limit has been surpassed. In order to set things right I typically have to conduct a water exchange, removing 10 - 15 gallons of tank water and replacing them with 10 - 15 gallons of distilled water, so I have not been able to avoid the manual water changes that were the reason for my decision to purchase the Dialyseas unit. Fortunately this dilution process seems to be necessary only once every 2 or 3 months! I do not know if this problem is restricted to my particular unit, or if it is characteristic of all Dialyseas instruments. I attempted to discuss this matter with Gerry when it first arose, but all I received was a cut-and-paste response featuring instructions for setting the high-conductivity limit's value. First, a clarification: When I purchased the Dialyseas system in 2002 a specific salt mix was strongly suggested. I purchased 12 buckets of the suggested salt at that time. More recently, Seavisions has sent a letter indicating that users can substitute any salt mix they choose, although they still offer Coralife Scientific Grade Salt for Dialyseas on their website. All of the measurements and subsequent discussion apply only to the salt I purchased in 2002, and may not apply to any other salt mix. I asked for, and received, an assay of the salt mix from Seavisions. The data presented below are from a solution of 35 ppt salinity (= seawater). I do not know which analytical technique was used to acquire these data. A sampling of the values supplied is shown in Table 3, along with some comparison values taken from Atkinson and Bingman, Aquarium Frontiers, 1999. Table 3: Assayed content of Dialyseas salt, Instant Ocean, and natural saltwater. The Dialyseas mix does not introduce any worrisome outlying components compared with either Instant Ocean or natural seawater. These data are not the whole story, however, because only a solution of this salt, and not the solid salt itself, is infused into the aquarium's water. So a more pertinent question is, "What's in a solution of Dialyseas salt?" Perhaps the components' ratio may differ from the above table upon dissolution if not all species are in readily dissolvable form. In this speculative scenario, some ingredients may remain unavailable to the aquarium despite registering in the solid assay. The actual measured values of all of the major ions in a 35 ppt salinity Dialyseas salt solution, save potassium, were reported in Experiment 5, Section II.6. These readings are not inconsistent with values found in both established reef aquariums and in natural seawater (the high sulfate reading excepted). I use both a calcium reactor and a Nilsen reactor in concert to maintain adequate calcium levels (typically 400 - 440 ppm) in light of this salt mix's deficiencies and the calcium loss inevitable in the dialysis process. Even this measure of salt solution content, however, is really irrelevant to anything but the initial tank fill. During the Dialyseas' operation, the ~50 lbs of salt in the 5-gallon bucket is infused with RO/DI water, slowly dissolves, and then the supernatant is pumped into the sump in measured amounts per the water's salinity requirements. So the critical questions are, "What is in this supernatant, and how does this concentrated solution's salt content change during the salt bucket's ~ 3-month life?" That is, does the salt addition process introduce any ionic imbalances into the aquarium water as a result of unnatural, or varying, ratios of components in the concentrated mix? The results of Experiment 5 demonstrated that the dialysis purification process does not, in and of itself, lead to significant ionic imbalances, but is the salt mix addition function absolved from this potential problem as well? To answer these questions I monitored the supernatant's contents over the course of 11 weeks, the useful life of that particular bucket (I was using a dialysis rate of 2 gpd at that time). The data are presented in Figures 6-8 (below). At approximately 1-week intervals, 2.0 mL portions of the supernatant were removed by syringe from the salt bucket, and this concentrated solution was added to 10 mL of distilled water. This diluted solution was assayed for total salinity with a temperature compensated Milwaukee refractometer, calibrated with both 18-megaohm/cm water and a purchased 35 ppt salinity stock solution. Concentrations of calcium, magnesium and total alkalinity were assayed using Salifert test kits as described in Experiment 1. The sodium selective electrode and the Hanna chloride and sulfate test kits were not available to me at the time that this experiment was conducted, and so these ion concentrations were not measured. The 5:1 dilution factor was chosen to ensure that the actual raw experimental readings fell within the standard dynamic range of the test kits and refractometer. The values reported in Figures 6 and 7 were obtained by multiplying the raw measured values by 6. Only single point measurements were taken as a concession to both time and cost, and an estimation of these types of measurements' precision and accuracy can be found with the discussion of Experiment 1. The pH of the salt bucket's supernatant was measured only periodically, and the following values were observed: 2 weeks- 7.2; 3 weeks- 7.0; 5 weeks- 6.9; 5.5 weeks- 6.9. Figs.6 (top left) , 7 (top right) and 8 (bottom). Assay of salt bucket supernatant contents as a function of time. (1) Only about 80% of the salt mix is usable. The solid residue at 11 weeks had little apparent solubility in water, but was readily soluble in 1M HCl. Although no further characterization was attempted, this solid is likely a mixture of MgCO3 and CaCO3, among other components. The solid insoluble residue (~ 4.5 Kg wet solid), however, cannot be all, or even mostly, CaCO3 or MgCO3, because taking the Dialyseas solid salt assay concentrations at face value, the initial 50 lb salt bucket contains about 260 gms of Ca, 856 gms of Mg, and 130 gm of CO3/HCO3. 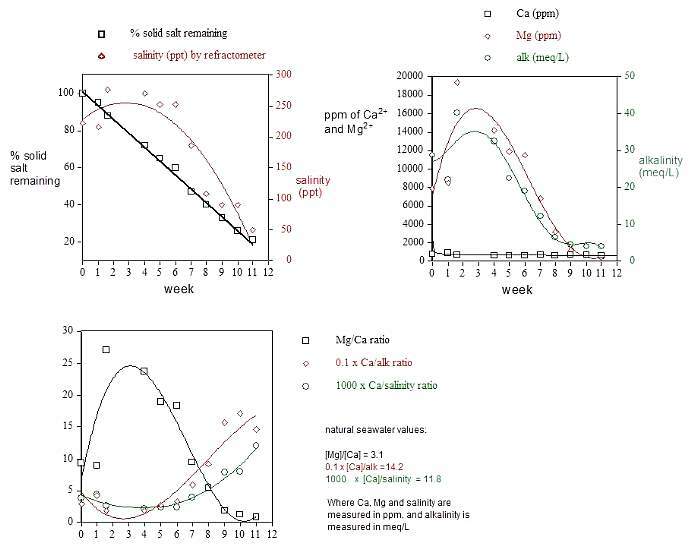 (2) The magnesium levels and alkalinity levels shown in Figure 7 (and the measured salinity in Figure 6) all appear to max out about 3-4 weeks after the beginning of usage. An explanation for this observation based on thermodynamic considerations is not readily apparent, as the components' solubility (Ksp's) shouldn't vary too much throughout the experiment (they vary a little as the supernatant's overall composition changes). Perhaps these data reflect the various salt components' dissolution kinetics (= rate). The water's infusion into the solid salt mix is slow, and no deliberate mixing is performed. (3) The calcium levels remain remarkably consistent throughout the time period. Although the graphical presentation in Figure 7 compresses the calcium data to accommodate the magnesium data's larger dynamic range, the numeric values (706 ± 108 (15%) ppm) confirm this remarkable consistency throughout the salt mix's usage. (4) By week nine, when about 2/3 of the solid salt has been consumed, the overall salinity, magnesium and alkalinity (~ carbonate concentration) have been depleted to the point where little of these components appears to remain in usable form. At 11 weeks, I changed the salt bucket. 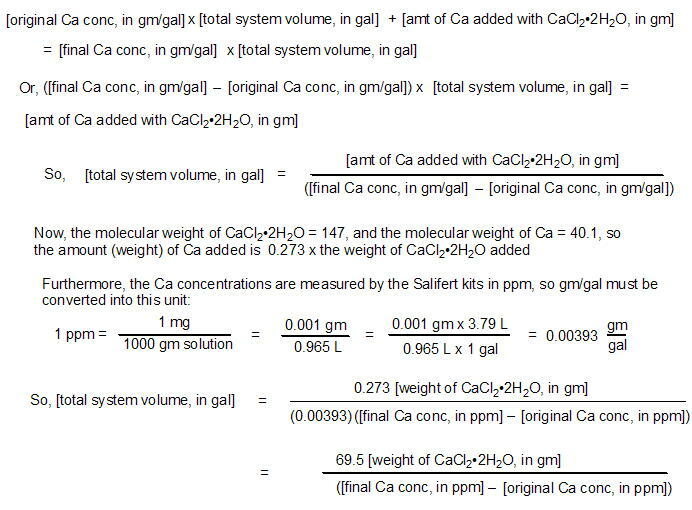 The measured calcium ion concentration, [Ca] = 706 ppm = 706 mg Ca in 1 Kg of solution. To convert to M/L, the units necessary for the supersaturation calculation, 706 mg/40 mg/mmol (MW of Ca) x 0.001 (convert mmol to M) = 1.75 x 10-2 M of Ca. 1 Kg of solution ≈ 0.75 L, because the salinity at the four week mark was about 250 ppt. So, [Ca] = (1.75 x 10-2 M)/0.75 L = 2.3 x 10-2 M/L. The measured alkalinity, [alk] = 32 meq/L, must be converted to M/L of CO32- for the supersaturation calculation. This measured alkalinity is due almost entirely to bicarbonate HCO3- (see below), but any carbonate present will consume 2 meq of acid titrant, so the mmol of CO32- = 0.5 x the meq of CO32-. The [CO32-] can be calculated at pH 7.0 (the value at the highest measured [CO32-] and [Ca] in the supernatant) by applying the Henderson-Hasselbach equation to the carbonate equilibria. For this calculation, the pKa's of the carbonate equilibria in the high ionic strength supernatant (250 ppt ≈ 5.2 M) can be estimated from data provided by Millero: pK(H2CO3) = 6.2, pK(HCO3-) = 8.9 (Millero, Thurmond, 1983). [CO32–] ≈ 0.011[total alk.]. So, [CO32–] ≈ (0.011)[0.5 x 32 mmol/L x 0.001 (convert mmol to M) = 1.8 x 10-4 M/L. I don't have a value for the Ksp of CaCO3 at pH = 7.0; Holmes-Farley supplies one for aragonite at pH = 8.2, natural seawater: Ksp = 6.5 x 10-7 M2/L2 at 25°C. (Holmes-Farley, 2002). So, supersaturation ≈ [2.3 x 10-2 M/L][1.8 x 10-4 M/L]/(6.5 x 10-7 M2/L2) = 6.4. The CaCO3 supersaturation of normal seawater (for aragonite) ≈ 3. It is likely that this calculated value is high, as the true Ksp for CaCO3 under pH 7.0 conditions is likely to be larger than the pH 8.2 value used. If this analysis is correct, then why doesn't the CaCO3 just precipitate out at such a supersaturation? The answer is, in fact, that it does, at least to some extent. Recall from (1) above that about 20% of the salt mix is insoluble at the end of the salt bucket's life, although no components are insoluble if fresh salt is mixed to 35 ppt. It appears that some of the soluble CaCO3 and, presumably, MgCO3, precipitates out during use. Because most of these ions stay in solution for the salt bucket's entire life (cf. Figure 6), however, the Dialyseas approach using a concentrated salt solution appears to work. Why doesn't more of the Ca and CO3 precipitate out? The likely reason is tied to suppression of the CaCO3 deposition rate. High magnesium concentrations, as present here, interfere with CaCO3 deposition by binding competitively to the growing aragonite/calcite crystal face. This competition retards the rate of CaCO3 crystal growth. 6) The ratios of measured components (Figure 8) change dramatically over time, and at almost no time do these values correspond to natural saltwater values (given adjacent to Figure 8). In contrast, the dialysis purification process leaves these ratios relatively unchanged, and at values similar to the natural saltwater ones (cf. Figure 5). These results raise the obvious question, is the Dialyseas capable of maintaining an appropriate ionic composition over time? I monitor the aquarium water's [Ca2+], [Mg2+] and [alk] weekly, and although these values fluctuate they do not exceed desirable parameters under normal circumstances, the specific exceptions detailed under II.7 Salt Delivery notwithstanding. 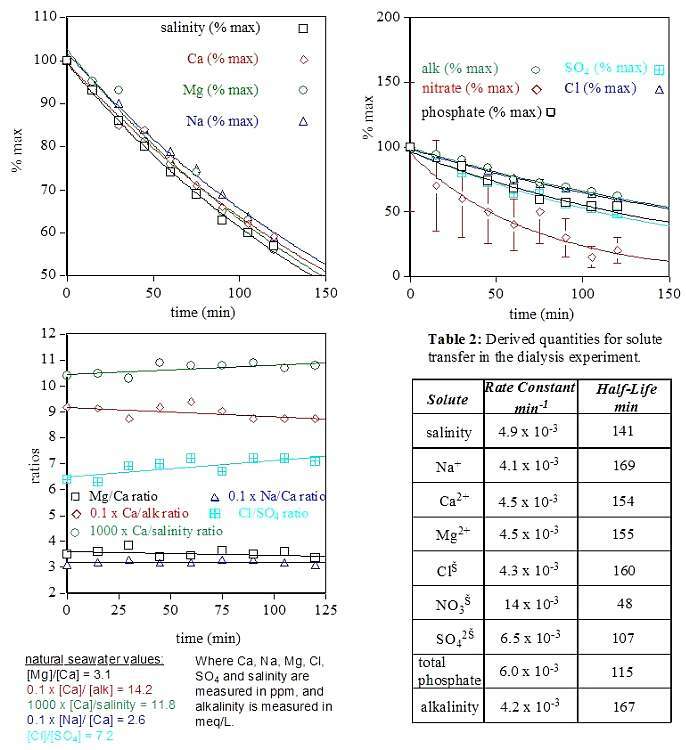 The [Ca2+] levels typically fall within the 390 - 425 ppm range without supplementation (i.e., CaCl2 addition), the alkalinity spans about 3.5 - 4.0 meq/L, and the magnesium runs a little high, as expected from the data presented in Figure 7, at 1500 - 1650 ppm. It is possible that this apparent contradiction between the aquarium water values and the salt bucket supernatant values can be resolved by noting that the salt bucket's contents are disbursed into the aquarium water in small increments, perhaps on the order of < 1 gpd (this amount is not recorded by the Dialyseas). Compared to the system water volume (~ 167 gallons), it is clear that the effect of any one small increment of ionically unbalanced concentrated salt solution will be negligible as a consequence of dilution. Over time, the average ionic ratios must equal the original amounts of components present, which are similar to natural seawater. Thus, it is possible that the fluctuations in salt component content are averaged out over the course of the salt bucket's useful life. Overall, these results demonstrate that the basic Dialyseas design element of adding concentrated salt solution to regulate the tank's salt content is not only feasible but can be implemented. "The Seavisions website details Dialyseas' claimed benefits, which include reducing the concentrations of undesirable solutes (ammonium, phosphate, nitrate, etc.) to arbitrarily low levels, and maintaining high water quality almost completely automatically with little day-to-day input from the aquarist." In my experience, the Dialyseas fulfills these claims. I subtitled this analysis "Pros and Cons," and in no way do I feel that I have been "conned by a pro." After studying the system in operation for over 18 months, I can find no evidence of deception or misinformation in Dialyseas' description and marketing. The Seavisions Company offers a quality product. This system represents a novel approach to addressing the water purification and water exchange requirements any aquarist faces. By and large it performs as advertised, although the problem with occasional oversalting should be noted. It has proven to be a robust and reliable technology in my hands and an asset to tank maintenance. Its automatic water change function is its primary value to me for the reasons described in Section I.6. Whereas other cheaper automated and semi-automated pieces of equipment are available to perform water changes, I am not aware of any that can actually increase the tank water's salt content to bring it in line with a preset value. These other systems can add premixed salt water, but that operation, in and of itself, cannot raise the tank water's salinity to a preset target level. One significant consequence of this "concentrated salt solution approach" to maintaining water quality is that the equivalent of 210 - 250 gallons (Seavisions estimate) of appropriately constituted salt water can be packed into a volume no larger than 1 cubic foot (see the salt bucket's picture in Figure 1). This space savings has been a real benefit for me. The Dialyseas system has distinct and unique advantages over other automated water exchange methodologies on these two points. 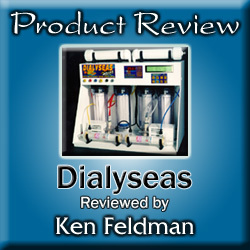 I am less favorably inclined toward the value of its dialysis-based purification capability, despite the fact that this purification function appears to be the primary selling point advertised by Seavisions. The data support the conclusion that the Dialyseas can, in fact, deplete the aquarium water of undesired contaminants without causing ionic imbalances in other desirable water components. However, the concentrations of undesirable metabolites (ammonium, nitrate, nitrite, phosphate, etc.) that it removes are typically so low in a mature reef tank under standard operating conditions that the extra purification by the dialysis process seems, perhaps, to be overkill. On the other hand, the concurrent removal of desirable solutes, in particular calcium, seems like a big downside as it places added pressure on the calcium input devices (Dialyseas concentrated salt solution, Nilsen reactor, calcium reactor, others?) to keep up. In the final analysis, of course, the question of whether the Dialyseas is worth the money is a question that can be answered only by each individual aquarist according to his/her own standards of expense vs. value. I hope that this analysis has provided some useful guidance for those contemplating this question. Acknowledgments: Funding for this study from the State of Pennsylvania and E. I. du Pont de Nemours and Company is gratefully acknowledged. In addition, thanks to Randy Holmes-Farley for a critical reading of this manuscript and many helpful suggestions. Holmes-Farley, Randy. Chemistry and the Aquarium: Calcium. Advanced Aquarist, March 2002. Pilson, Michael E. Q. 1998. An Introduction to the Chemistry of the Sea. Prentice Hall Publ. Co. 431 pp.